The Sacred Jewel fragments of the Shichinintai have been taken by Naraku! You've finally shown yourself, Naraku! It has begun. But, it will soon end. This is Naraku's new body. Inuyasha and his friends would die here. I'll have a new body too. Naraku finally appeared! What's his intention this time? Next on Inuyasha, "Naraku Reborn, Beyond the Darkness". Apart from Lord Sesshomaru, I’ve never felt such a strong aura before. I may just die if I follow him any further… Lord Sesshomaru! All the best! KAG: Bankotsu is defeated by Inuyasha, the battle with Shichinintai finally came to an end. With the power of Shichinintai’s jewel fragments, the reborned Naraku finally appears before us. Recap from previous episode, of the fight between BKS and INU. BKS raises Banryuu and throws the orb at INU. A vortex starts to surround TET. As Banryuu's demonic energy orb is about to reach INU, he raises TET. INU swings TET downwards. The orb is sent back at BKS together with the wind vortex. A shocked BKS tries to shield himself with Banryuu, but the energy causes the blade to shatter. BKS yells in horror as the energy reaches and consumes him. Cut to INU panting. Cut to BKS who is partially buried under a rubble. BKS chuckles self-deprecatingly. He tilts his head and dies. Suddenly tentacles reach out of the ground and tangle around INU. BKS is also sucked into the ground. Cut to SHI and KAG in a shaft. The ground under them crumbles and they fall. Cut to KIR saving MIR and SAN from falling. Cut to SHI in his pink flying form, sweating, with KAG on top. SHI: (struggling) Kagome… I got you…! Suddenly tentacles rush out from the pit and reach all the way to the top. Among the tentacles, INU is tangled within and is unconscious. KAG: Inuyasha! Inuyasha!!! (thinking) Inuyasha… What happened to you, Inuyasha? (speaking) INUYASHA!!! The tentacles tangled around INU stops moving. INU's ears twitches and he wakes. SHI, in his pink flying form, flies towards INU with KAG on top. INU: Idiot, why are you here?! INU: I told you to wait outside, didn't I? KAG doesn't reply. She tries to pull the tentacles tangling around INU, but doesn't even budge it. INU is at a loss for words. He scoffs and looks away. INU: You shouldn't worry so much. Hey, wimpy wolf. I knew it… (gasps) What happened to that wimpy wolf? SHI: Koga was swallowed by these walls. INU: (shocked, thinking) The wimpy wolf was swallowed? KAG: That's why you have to try to escape! KAG continues to pull at the tentacles while INU tries to break free. INU: Damn, this thing…! (looks up and gasps) Kagome, get back! Suddenly, NAR's laughter is heard in the background. MIR: (worried, thinking) That can't be. What an incredibly evil presence. It must be Naraku's aura. INU struggles to break free and is seized by a sudden pain. NAR: Unable to move, Inuyasha? Near the top of the shaft, NAR's face is gradually seen. Everyone gasps in shock. INU growls angrily. NAR: Congrats on making it here.I had plans to welcome you. But seems like you're a little late, you're already trapped between the walls of my intestines. It's over for you guys. INU: Over? What are you talking about?! Do you think it's that easy?! It'll be over when I rip out your throat!! KAG's Sacred Arrow misses NAR. HIR cuts through some tentacles and misses NAR. Acid oozes out from the broken tentacles and drips on them. Burning sounds are heard. KAG: This is acid! Oh no! We'll be dissolved! A tentacle reaches out and whips KIR, SAN and MIR, pinning them against the wall. SHI flies towards them. Another tentacle reaches out and grabs SHI. SHI wails in horror. The tentacle squeezes SHI and he pops back into his normal form. It then tangles around KAG and SHI. NAR: How foolish. You don't get it still? The whole of Mount Hakurei is now part of my body. In other words, all of you are inside my body. SAN: These walls of flesh are part of Naraku? SHI: Ka-Kagome, does that mean we'll also be eaten up like Koga? SHI: He's talking about me?! NAR: There's only Inuyasha the half-demon, and a few humans… Eating you guys will only weaken my powers. A tentacle rises up to NAR, holding up the dead BKS. INU growls angrily and grinds his teeth. NAR: (laughs) From what I see… Humans are nothing but fools! A few thin tentacles reach around BKS's left hand and hoist it up. Another tentacle pierce through the arm and takes out the remaining two Sacred Jewel shards. SHI and KAG gasps in horror as BKS disintegrates into a skeleton. CUT TO FLASHBACK from episode 121, when BKS faced off with INU. BKS: All my brothers in the Shichinintai died in battle. I'll avenge my buddies by killing you. Cut to previous episode when BKS punched INU, sending him flying onto a rock wall. BKS: What's up, Inuyasha? I thought it'd be easier for you to get the fragments, thus I'm punching with this hand. INU: However, he was hundreds of times more decent than you! And yet you call him foolish, Naraku?! NAR: Why are you so worked up, Inuyasha? You are the one who killed Bankotsu. Another tentacle then reaches towards Banryuu and takes out the two Sacred Jewel shards embedded in the blade. Another tentacle pierces through INU's chest and seizes the five shards that he took from BKS. The tentacles then place the collected shards around NAR. Cut to KIK shooting the demons outside Mount Hakurei. KIK: (worried, thinking) The Sacred Jewel fragments are gathering into one. You've finally shown yourself, Naraku. Cut to SES and JAK walking along a path on Mount Hakurei. SES stops and looks up. JAK: Did you say something, Lord Sesshomaru? SES ignores him and resumes walking. SES: (thinking) Naraku. You've finally shown yourself. JAK: (looks up weakly, thinking) Apart from Lord Sesshomaru, I've never felt such a strong aura before. I may just die if I follow him any further… (shouts) Lord Sesshomaru! SES turns and looks at JAK. There is a short moment of silence. JAK: (crying and waving hand) All the best! SES thumps JAK on the head and resumes walking. Cut to KOH and KAN in a cave. KAN: (walking away) It has begun. KAN: But, it will soon end. KOH: Is it alright if we don't wait? KAN: Kagura… isn't here anymore. KOH looks towards the deep part of the cave. An image of SAN appears. KOH pauses a moment and runs after KAN.
Back to INU-gang and NAR. SAN: The Sacred Jewel fragments are gathering as one! The fragments merge slowly together and the cave is enshrouded with a bright light. Everyone gasps. Slowly, the rest of NAR's body forms. A pair of wings appear behind him and he wears an armor-like suit with bony spikes. A red eye then appears across NAR's chest. A pink barrier surround NAR and he floats towards INU, laughing. NAR: How pitiful. All my sworn enemies, went through so much to get here, and yet they can't do anything to me. INU: What a disappointment! You went into hiding for so long, and I thought you'd become an amazing monster! MIR: (thinking) You're wrong, Inuyasha… Naraku is… (shouts) Inuyasha! Naraku's evil aura is much stronger than before! INU: Evil aura? Don't make me laugh! Keh! I think… It's just another trick of his… Naraku's power have just gotten worse! INU struggles furiously and finally breaks free from the tentacle tangling him. INU: (springs towards NAR) Iron Reaver, Soul Stealer!! INU claws at NAR's barrier but is thrown back. NAR: What a joke. To think that you would oppose me, Naraku, with your bare hands. INU: I get it. I'll gladly grant your wish to die…! Come, Tetsusaiga!! INU holds up TET's sheath which throbs. TET then bursts out from one of the tentacles. INU leaps and catches TET. INU: Now, prepare to die! Wind Scar!!! NAR holds up his right arm. A red orb enlarges on the back of his palm and one of the spikes enlongates. He then swings the spike and deflects the Wind Scar. INU: (shocked, thinking) He deflected my Wind Scar?! The Wind Scar is deflected onto MIR and SAN, nearly hitting them. It then reflects onto SHI and KAG, nearly hitting KAG. The tentacle tangled around SHI and KAG breaks and they fall, shrieking. The Wind Scar continues to reflect around the walls of the shaft. INU: (leaps) Wind Scar wouldn't disperse. Kagome! INU grabs SHI and KAG and lands. SAN then holds up HIR. SAN: Priest, get behind Hiraikotsu! The Wind Scar then hits HIR and the group gasps. NAR: Inuyasha, I have entangled your Wind Scar in the flow of my aura. INU: Kagome, are you okay? SHI: (panting) Inuyasha, you idiot! You let Naraku trick you into unleashing your Wind Scar! SHI: (points) Here it comes again! NAR: Your Wind Scar will continue to circulate until you end up in small pieces. Inuyasha, you'll finally have a taste of your Wind Scar. Cut to KIK looking at Mount Hakurei. KIK: (thinking) The evil aura is whirling around Mount Hakurei. Something flies out from Mount Hakurei. KAR, flying on her feather, is carrying a bundle in her arms. KIK draws an arrow and shoots. KAR gasps. She flies higher and dodges the arrow. Voice: Stop, Kagura. You have no right to touch Kikyo. The bundle seems to contain a small child. KAR is shocked. KIK: (thinking) Naraku, what in the world are you doing? Back in the shaft. The Wind Scar continues to circulate. KAG: (thinking) The wind… We have to do something about this wind! NAR: (thinking) Inuyasha and his friends will die here. And I have obtained a new body. Only one thing remains. An image of KIK flashes momentarily across the screen. NAR then floats higher. INU: Where do you think you're going, Naraku?! KAG suddenly notices some light emitting from under NAR's feet in the barrier. KAG: (thinking) Those are…! (speaking) Go after him, Inuyasha! KAG: I'll go with you! If this wind is Naraku's evil aura, maybe I can get rid of it! Besides, I can see them. There are two Sacred Jewel fragments at Naraku's feet! INU: Two? (gasps) Wimpy wolf's fragments? KAG: I'm sure of it. Naraku may be planning to absorb Koga into his body since he's a demon. We have to save him! INU: (worried) Keh! That's only if he's still alive. The Wind Scar nearly hits them again. INU and KAG look at each other determinedly. KAG nods. Cut to INU leaping, piggybacking KAG. KAG has INU's Fire Rat Robe worn across her head. SHI cowers in terror between them. INU continues leaping towards NAR while dodging the Wind Scar. NAR: (scoffs, thinking) Have they lost their minds? They're jumping into the Wind Scar. KAG draws an arrow. NAR is taken aback. INU: Kagome! The evil aura is swirling around Naraku! Don't worry about it! Just shoot Naraku down! KAG: Got it! Watch me! KAG fires and the Sacred Arrow pierces through the Wind Scar and hits the barrier. The arrow manages to make a hole at the bottom of NAR's barrier. A slimy ball containing an unconscious KOG then drops out. NAR: (laughs) You're worried about your friend at a time like this? I am quite disgusted by your foolishness. MIR: The Wind Scar has dispersed…! NAR raises his hand. The walls around the shaft start to crumble and fall. A miasma then appears from various spots of the wall. KOG falls into the deep pit below. INU jumps after him. NAR continues floating upwards. Cut to KIK standing outside Mount Hakurei. Don't worry, Kagome, I'll get the wimpy wolf out of here! Inuyasha went to save Koga! 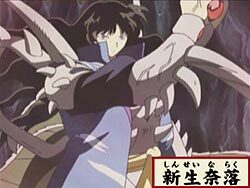 In this short time, Naraku has appeared in front of Kikyo! Tell me, Naraku! What is your true intention?! There's a river of poison just behind you. With a fake body like yours, you won't have a chance at survival. Kikyo, this will be your grave! Next on Inuyasha, "Farewell, My Beloved Kikyo". And the one who couldn't save her is you, Inuyasha.